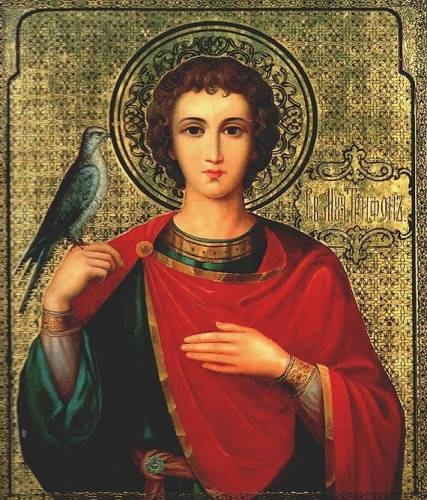 In Russia, St Tryphon is regarded as the patron saint of birds. He is especially venerated in Russia. I often wonder that we have too many monks in the Orthodox Church and not enough martyrs – martyrs who had a voice in shaping our liturgical tradition, that is; martyres, witnesses, to faithful living in the midst of a complex world. Then perhaps we might have more readings like today’s Epistle reading from Romans. The normal reading for this Sunday is 2 Timothy 3:10-15, but thanks to the holy martyr Trypho, who died for his faith about the year 250, we were blessed to hear the Epistle reading for his feastday, Romans 8:28-39. The Ecumenical Patriarchate often substitutes the Epistle readings, and sometimes also Gospel readings, for some saints when they fall on Sundays, out of concern to introduce some variation in the normal cycle of reading. Saint Trypho (or Tryphon) is not a major saint, but the Patriarchate chose the saint’s Epistle reading today anyway. We don’t get the benefit of any changes in the next three Sundays from the normal appointed readings: 1 Corinthians 6:12-20, 1 Corinthians 8:8-9:2, and Romans 13:11-14:4 – and you’ll notice all three readings have to do with food! But thanks to Saint Trypho, we heard today one of the most magnificent sections of the New Testament. I referred to this chapter two Sundays ago, the part earlier in the chapter where Paul tells us about all creation groaning, as it waits to share in our glorification. Today’s reading is the climax of the chapter. And indeed, it is about glorification that Paul speaks to us. … For those whom he foreknew he also predestined to be conformed to the image of his Son, in order that he might be the first-born among the many who are his brothers and sisters. And those whom he predestined he also called; and those whom he called he also justified; and those whom he justified he also glorified. οὓς προέγνω, καὶ προώρισεν συμμόρφους τῆς εἰκόνος τοῦ υἱοῦ αὐτοῦ, εἰς τὸ εἶναι αὐτὸν πρωτότοκον ἐν πολλοῖς ἀδελφοῖς· οὓς δὲ προώρισεν, τούτους καὶ ἐκάλεσεν· καὶ οὓς ἐκάλεσεν, τούτους καὶ ἐδικαίωσεν· οὓς δὲ ἐδικαίωσεν, τούτους καὶ ἐδόξασεν. This passage has been highly controversial in many Christian circles because it raises the matter of “predestination” – but is it a false problem? Does God “foreknow” only some people? Is his foreknowledge limited? 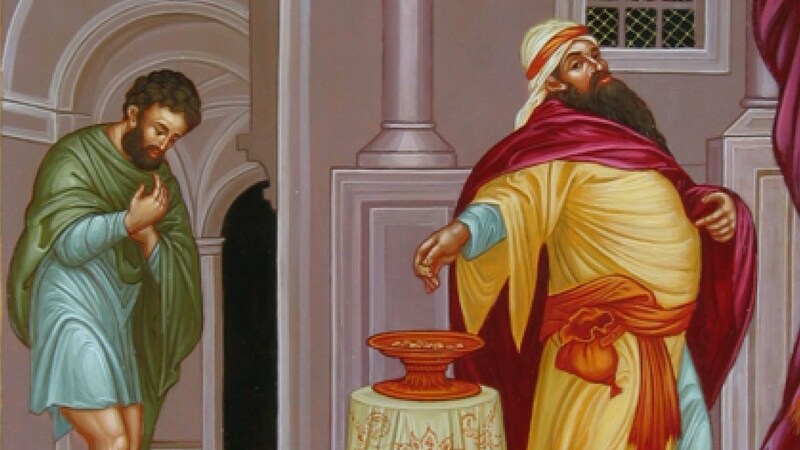 Did God foreknow the Pharisee, the publican, or both, in today’s Gospel reading? Note the sequence: Foreknow – Predestine – Call – Justify – Glorify! God foreknows everyone and predestines everyone to be “conformed to the image of his Son.” Just as ALL creation waits for the adoption and glorification of God’s children, so God’s intent is for ALL to accept the calling. But not everyone will accept the calling. God does not predestine some to be saved and some to be damned. We separate ourselves from each other, as the Pharisee did from the tax collector. Paul here is not thinking about whom God predestines to be saved or not to be saved (as some Christian groups think). Paul is saying that God’s intent has always been that we be conformed to the image of his Son, Jesus Christ. This is what we are “predestined” for. Paul reveals the infinite reaches of God’s love as it extends to every single human being. And it follows from the statements about the creation groaning. Nothing can separate us from the love that all of creation receives. And nothing can separate us from the pain of creation as it is groaning and waiting for deliverance and glorification. … Who shall separate us from the love of Christ? Shall tribulation, or distress, or persecution, or famine, or nakedness, or peril, or sword? … I am sure that neither death, nor life, nor angels, nor principalities, nor things present, nor things to come, nor powers, nor height, nor depth, nor anything else in all creation, will be able to separate us from the love of God in Christ Jesus our Lord. Everything works for good in the lives of those who share in God’s purposes (Romans 8:28), Paul tells us. A small boy named Wally lived in a suburb of Sydney. None of his classmates liked him, especially his teacher, who always yelled at him. One day Wally’s mum came to school to check on how he was doing. The teacher told his mum honestly, that her son is simply a disaster, getting very low marks and she had never seen such a dumb boy in her entire teaching career. The mum was shocked at the feedback and withdrew her son from the school and even moved out of Sydney! Twenty-five years later, the teacher was diagnosed with an incurable cardio disease. All the doctors strongly advised her to have heart surgery, which only one surgeon could perform. Left with no other options, the teacher decided to have the operation, which was successful. When she opened her eyes after the surgery she saw a handsome doctor smiling down at her. She wanted to thank him, but could not talk. Her face started to turn blue, she raised her hand, trying to tell him something but eventually died. The doctor was shocked and was trying to work out what went wrong….. When he turned around he saw our friend Wally. He was working as a cleaner in the clinic, and he had unplugged the oxygen equipment to connect his Hoover! You really expected this to be one of those teary-eyed stories, about how Wally became a heart-surgeon, didn’t you? Well, many times things don’t work out for the best, despite Paul’s assurances. But we can experience unity with all humanity and all creation. We are in this together. And that is the real message of Paul and our Gospel today. Or, as he wrote in Ephesians 4:13, “to the measure of the stature of the fullness of Christ.” We are called, predestined to become like Christ – to become Christ to each other, Christs to God. All of us… finally. That’s the whole gospel, the whole message: as easy… and as hard, as that. Categories: Sermons | Tags: Parable of the Publican and Pharisee, predestination, Romans 8, Saint Tryphon | Permalink. I loved the story of Wally, and I confess that I too thought that he was the actual surgeon. :-). of course that is the product of all kinds of religious literature ( if you ever need tear-jerking stories, I could recommend a couple of books with more traditional endings you could use). However, i think the ending you presented was just perfect! On a related note, The part that especially attracted my attention was the mention of the subject of predestination and salvation. Of course I had heard many debates on this subject…but this brings me to another related observation. i fear that , like the Wally story, we humans are often addicted to boxed answers and simple explanations to complexities beyond our ability to understand. How can one, an entity limited in time and space and knowledge, hope to explain the thoughts of God, the provision of God or the nature of God is beyond me. Of course, some revelation was given to us in scripture, but to assume that we have the ability to extrapolate from what was revealed, is a stretch, if I may use that highly understated position. I would like to meet some of these people who seem to know for sure what God foreknew and when, and to have them then explain how this works in the realms of beyond and before time and space… I’d like them to try, anyway . I think it would make for a very good laugh.